Democratic and Republican negotiators will meet on Monday afternoon in a last-ditch effort to salvage faltering government funding talks amid a raging debate over immigration policy, according to three sources familiar with the meeting. The confab carries with it significant urgency: Negotiators have hoped to post compromise legislation that funds the government and gives President Donald Trump new money for border security by Monday evening to meet the House Democratic majority’s new rules and allow passage of the legislation through the Senate by Friday evening, the new shutdown deadline. If Monday’s meeting produces no progress, Congress and the White House will need to assess fallback options to avoid another shutdown. And Trump may need to consider unilateral action if he wants to get border barrier funding and avoid a shutdown. “Even if they succeed in restarting conversations, we are still way behind,” one Democratic aide said, adding that even staff-level talks have all but stopped since Saturday. Negotiations over border security and avoiding a second government shutdown fell apart over the weekend, as Republicans rejected Democratic efforts to cap the number of detention beds that Immigration and Customs Enforcement can use for enforcement in interior regions of the U.S. At issue are detention resources for undocumented immigrants already in the United States, which Democrats want to impose new restrictions on to prioritize enforcement on violent criminals. “A cap on ICE detention beds will force the Trump administration to prioritize deportation for criminals and people who pose real security threats, not law-abiding immigrants who are contributing to our country,” said Rep. Lucille Roybal-Allard (D-Calif.). “The Democrats do not want us to detain, or send back, criminal aliens! This is a brand new demand. Crazy!” Trump responded on Monday as he prepared to head to El Paso, Texas, for a political rally. Democrats familiar with the negotiations said the demand was not new and has been discussed for a week or more. The two sides are also still far apart on Trump’s demands for a border wall, with Democrats resisting efforts to fund new fencing but open to fixing existing barriers. The numbers discussed for border funding range from $1-2 billion, far short of Trump’s ask of $5.7 billion. Republicans said Democrats have offered little flexibility on physical barriers in a bid to deny Trump a win. 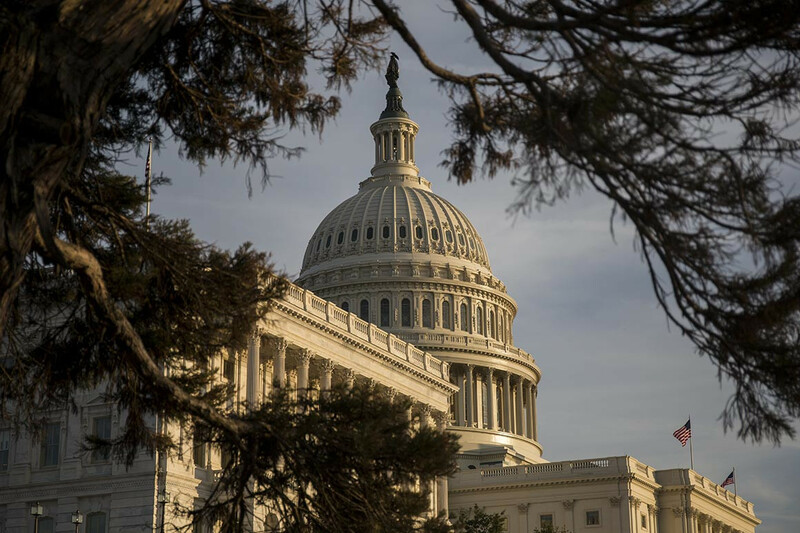 House Democrats have begun preparing a stopgap spending bill for the Department of Homeland Security that could last all the way until September. Democrats discussed the idea on a conference call on Sunday afternoon, though no final decisions have been made, according to two aides briefed on the discussion. Speaker Nancy Pelosi was also on the call. But even a continuing resolution for DHS could be thorny, as Democrats consider trying to block efforts from the Trump administration to shift money around within the federal government to fund Trump’s border wall. A January Democratic proposal included new restrictions on the administration’s ability to build the border wall with money in existing accounts. Without any changes though, Democrats fear that any status-quo spending bill could still fail in the House. The new Democratic majority would be approving another $1.3 billion for fencing without any reduction in detention beds — which the White House has been pushing. “It’s a tough sell,” another Democratic aide briefed on the talks said. The other government departments that need funding are less contentious and could be approved more easily.